Stems: Erect, simple proximally, branched above, glabrous or minutely hispid above. Leaves: Mostly cauline, alternate; blade linear-lanceolate, 2 to 6 inches long, .2 to 1 inch wide, base wedge-shaped to attenuate, margins serrate to serrate-dentate, tip tapering to long point, surfaces minutely hispid and gland-dotted. 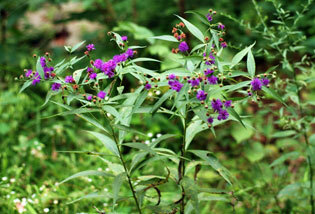 Inflorescences: Heads discoid, in corymb-like to panicle-like arrays; peduncles .8 to 2 inches. Involucres hemispheric, .4 to .6 inch. Phyllaries 50-70 in 5-6 series, narrowly lanceolate to linear, 1/6 to 3/10 inch, apex usually subulate to filiform, sometimes acuminate, usually curled inward. Flowers: Ray florets 0. Disk florets 50-100, corolla reddish-purple, 1/3 to 1/2 inch. Fruits: Achenes elongate-ellipsoid, 8-10-ribbed, 1/6 to 1/5 inch; pappus brown to purplish-brown, outer scales 10-20, 1/50 to 1/25 inch, inner bristles 20-40, ca. 1/4 inch. Comments: Named for English botanist William Vernon. Veronica arkansana hybridizes in the wild with V. baldwini, V. fasciculata, and V. missurica.